I use harmonics a lot in my bass arrangements, so I thought I’d do a complete guide to playing harmonics on bass. It’s too much information for just one video, so I’ve split it into two parts, natural harmonics and artificial harmonics. This video contains everything you need to know about natural harmonics on bass. Including the harmonic series and advice for making chord voicing using harmonics. I should start by saying that I’m not a big fan of the terms natural and artificial harmonics. To me, they are all just harmonics, they follow the same rules and principles. The distinction is that natural harmonics are created from open strings, whereas artificial harmonics are created from notes that are fretted with the left hand. Calling them natural or artificial makes as much sense as calling notes played on open strings ‘natural notes’ and notes fretted with the left hand ‘artificial notes’. There is nothing artificial about artificial harmonics, all harmonics exist naturally. However, there is a difference in the techniques that you use to play natural verses artificial harmonics, which I will look at across these two videos. So, I’ll continue to use the terms, natural and artificial, even though I’m not sure they’re ideal. So, natural harmonics are created by touching the open strings very lightly with your left hand and then plucking the string as normal with your right hand. For the harmonic to be clear, you must avoid the string making contact with any fret, and you should remove both hands from the string immediately after plucking with your right hand. The string should be left to ring as if it were an open string. The difference is that the note you will hear will be much higher than the open string. In order to properly understand and use harmonics, you must first become familiar with the harmonic series. The harmonic series is a sequence of tones that make up a musical note. Musical notes are not simple sound waves. In fact they’re very complex and they comprise a whole sequence of overtones that we call the harmonic series. We can explore this sequence on our basses by playing harmonics. The harmonic series is, in theory at least, infinite. So it’s impossible to learn or play the entire harmonic series. As you go further up the series, the harmonics become harder and harder to hear and to find on your bass string. So, I’m only really interested in the first few notes of the series. The series always starts at the exact half way point of the string. This means the halfway point between the nut and the bridge. On your bass, the halfway point is marked by the twelfth fret. You will always find a harmonic at the halfway point of any string that is pulled tight between two points. 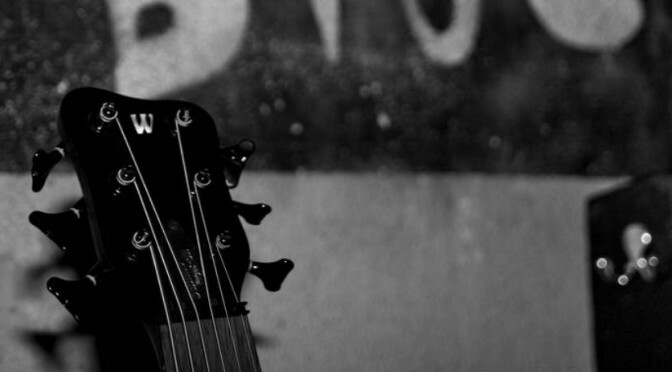 It doesn’t matter what note you tune the string to and it doesn’t matter what instrument you are playing. The harmonic at the twelfth fret will produce a note that is exactly one octave above the open string. So, the harmonic series starts with an octave and then is goes up a fifth and then to another octave. This will be a note two octaves above the open string. These harmonics will both occur in two different places on each string. One on the left side of the centre of the string, and one in the same position on the right side of the centre. 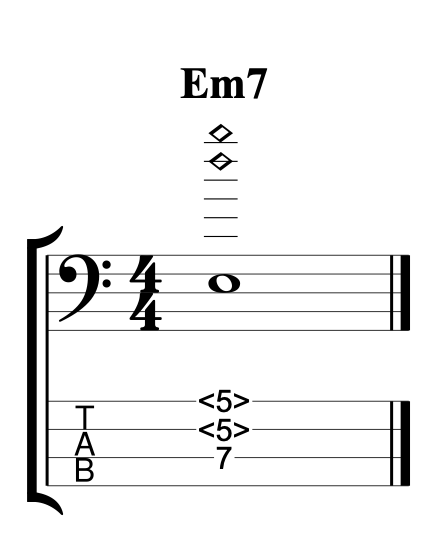 The next note in the sequence is a major 3rd above the previous note. So the harmonic series up to this point gives us a kind of major arpeggio. Here is the sequence written out on the first string of a four string bass. So, the sequence is written in G. The sequence goes, G, D, G, B. 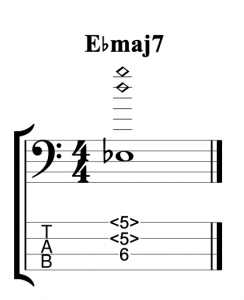 The same major arpeggio pattern will repeat itself on any open string, Root, 5th, Root, 3rd. Which makes it fairly simple to work out what notes you’re playing when you play these harmonics. 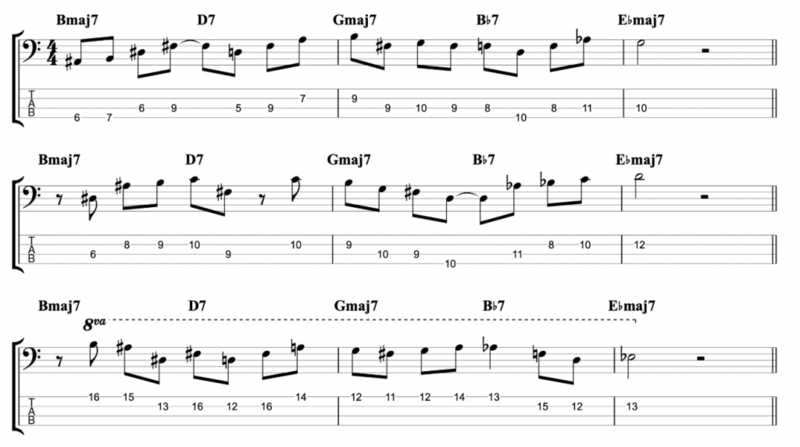 Once you know what the notes are, you can start to combine natural harmonics and normal fretted bass notes to create chord voicings. I gave two examples in the video, both using the harmonics D and G played on the fifth fret of the first and second strings. When you add the root note Eb to the harmonics D and G it creates an Eb major 7th chord. G is the major third and D is the major seventh. 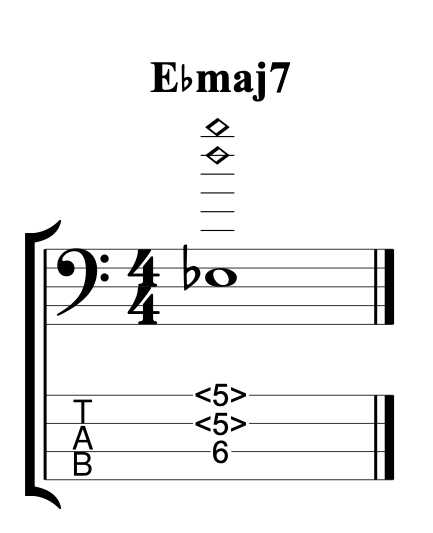 I’ve done that by fretting the Eb on the 6th fret of the third string, but there are other ways you could play this chord. 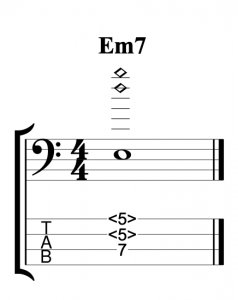 If you change the root note to E, you get an E minor 7th chord. The G and D become the minor 3rd and 7th.